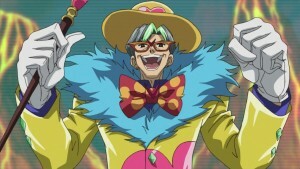 Mr. Heartland is a secondary antagonist who was the Mayor of Heartland City and the person responsible for relaying Dr. Faker’s orders to Kite Tenjo, until he fell into the Sphere Field Cannon and was sent to Barian World, where he was temporarily transformed into a small bug, and later reborn into a Barian and leader of the Fearsome Four of the Dark Dueling World. After being defeated by ZEXAL III, he was burned alive by the fake “Numbers” given to him by Vector. Mr. Heartland appears as a man usually seen in a green suit which covers a yellow shirt. 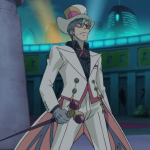 He also sports a pair of stylish orange glasses with a crimson “V” shape (similar to a heart) in the center. 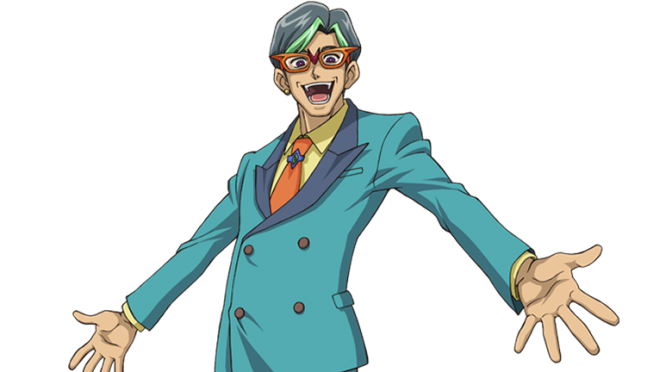 His hair is a similar green to his suit with a lighter green fringe. Heartland’s Barian form gives him a distinct, demonic appearance vaguely similar to his “Number” with purple and red skin, yellow eyes, bulging muscles, and a set of insect wings with a dark red fly thorax at the back. He loses his glasses and his head mutates and elongates, giving it the appearance of a bulbous thorax. His new face appears fairly insectile with jagged teeth and a set of jagged mandibles across his face (which makes him, along with Chironex, the only Barian to have a moving mouth). 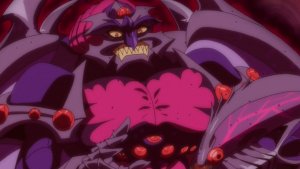 He also features seven red eyes along his abdomen and one at the top of his forehead. To the people of Heartland he is a benevolent government official who cares about the people who lived there. However, his true personality is that of a manipulative and deceitful man. He seems to enjoy seeing others in agony as he laughed when he tortured his child soldiers. He also gets annoyed if anybody calls him an “old man” (“dude” and “Mrs. Heartland” in the dub). 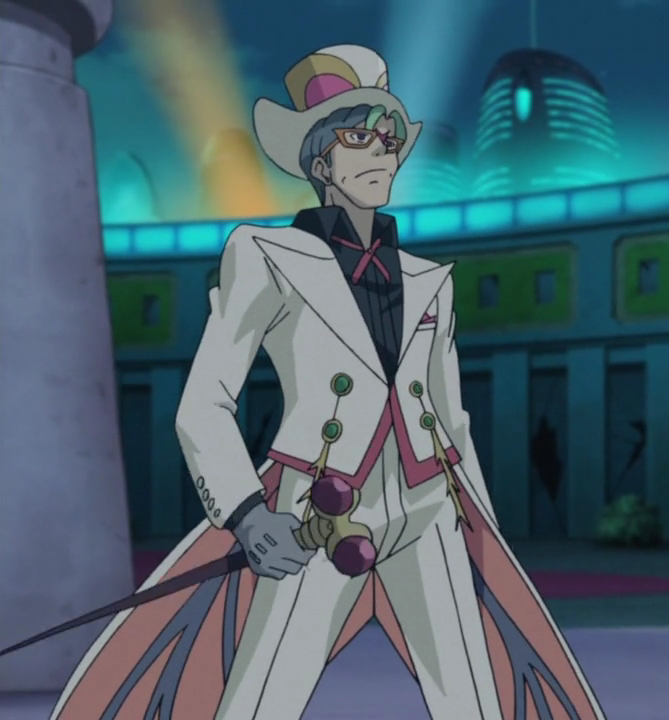 He is also very loyal to Vector for rescuing him from the Barian Sea and later for returning to his human form. He’s also fearful of his wrath due to his recurring failures. 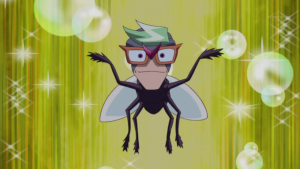 After being returned to his human form by Vector, Mr. Heartland gained the ability to summon a swarm of Barian insects and the ability to teleport using Overlay Networks. Like the other members of his gang, he can summon Don Thousand’s Emblem to halve his opponent’s Life Points and add it to his own. Mr. Heartland uses an “Infection” Deck, centered around “Infection Fly” and its ability to double its Level, by quickly Summoning three of them to achieve high Levels to Xyz Summon his ace monster, “Number 1: Infection Buzz King”. This card takes advantage of the opponent’s “Numbers” to use them as re-usable Overlay Units for its destruction effect that can inflict effect damage. If that fails, he uses various Spell/Trap Cards to Summon “Infection Bug Tokens”, which are able to whittle away at his opponent’s Life Points.